The heritage railway scene has, due to many ending up at the Barry Scrapyard, never really been short of Bulleid’s Pacifics of either the Merchant Navy or West Country / Battle of Britain type, but there is still a key missing link. The lack of an original condition Merchant Navy class is a large gap in the story of Southern Railway express locomotive development. With all 30 members of the Merchant Navy class having been rebuilt at Eastleigh in the late 1950s, it was never possible to preserve one in the unmodified original condition. That gap will soon hopefully be filled as The General Steam Navigation Locomotive Restoration Society intend to reverse the 1959 rebuilding of 35011 General Steam Navigation back to that original condition. The locomotive will now be undercover within a shelter for the first time since she was in service. This will allow her to be fully dismantled, which was not possible to commence at its previous location. The boiler can then lifted allowing the rolling chassis to be moved into the Swindon and Cricklade Railway‘s main works. I reiterate again that membership of the Society costs only £10 per year and full details on how to become a member can be found here. [Update 15/03/19] Great News! 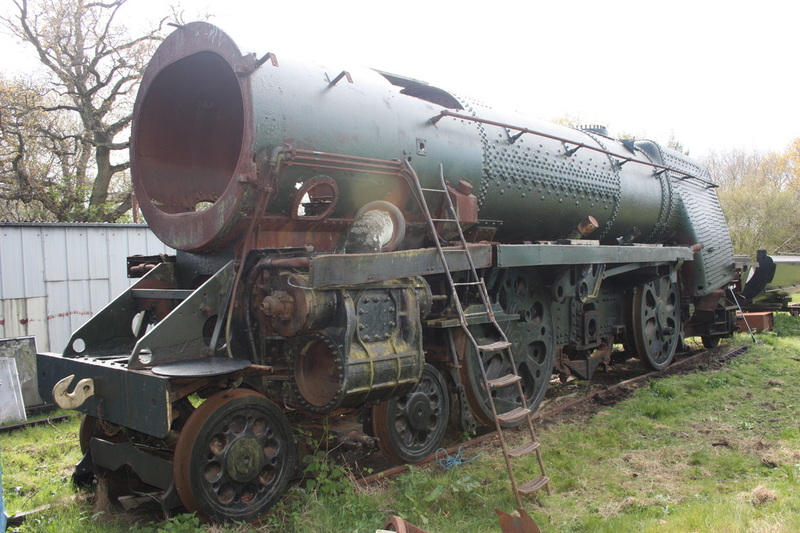 The General Steam Navigation Locomotive Restoration Society have been able to announce that locomotive will be soon moving to its new base of the Swindon and Cricklade Railway. The locomotive will be based within a shelter and will be the first time since she was in service that she will be undercover. She will then be fully dismantled, which was not possible to commence at its current location, and the boiler lifted allowing the rolling chassis to be moved into the railway’s main works where there is already room enabling the main restoration work to commence. In addition many original parts have been recently sourced and or manufactured and machined such as the spring beams for the front bogie and trailing axle truck and the Kilinger Valves. A set of injector valve handle castings that I am proud to have sponsored, prior to machining. [Update 08/08/18] Progress has been steady over the last few months, within the limits of what can be done at her current location, with the boiler receiving a further coat of protective paint and work on the trailing truck (being the only surviving fabricated style trailing struck). Also a variety of components have been sourced and machined, including impressive new nameplates and also injector valve handles (to which I contributed to the fund to sponsor these items. The Society have also acquired a brass lamp fitted with the bullseye lens, toggle switch to side and bulb holder inside. The lamp is reported to have come off Merchant Navy’ Class No. 35024 “East Asiatic Company”. Gaining the lamp is fantastic news for the project as the use of original components helps add character to the locomotive. The General Steam Navigation Locomotive Restoration Society was formed at the end of 2015 with the aim of taking over 35011 from her then owners and commence full restoration once a new location for this to take place can be found. The first major milestone of the new 35011 Locomotive Society of talking over ownership of 35011 took place in August 2016 and are now offering shares in the locomotive to fund the restoration. A number of working parties have already taken place to catalogue and properly preserve what remains of her currently; and a start has already been made on procuring new components. 35011 was built at Eastleigh and introduced as 21C11 in December 1944 as the first of the second series, 21c11 to 21c20, of Merchant Navy pacifcs she was paired to a 5100 gallon tender rather than the 500o gallon tenders for the first 10 locomotives (the final third series of 10 locomotives had even larger 6000 gallon tenders). Originally introduced in plain war time black livery she then gained malachite green in January 1947, followed by BR Brunswick Green in November 1951, being one of only 3 of the class not to gain the BR Express Passenger Blue livery. During this period she had the original style flat fronted cab (as per in the picture above) modified to the wedge shape in September 1950, and her boiler pressured from 280 to 250 psi in June 1954 although she retained the safety valve positioned towards the front of the boiler until rebuilding. 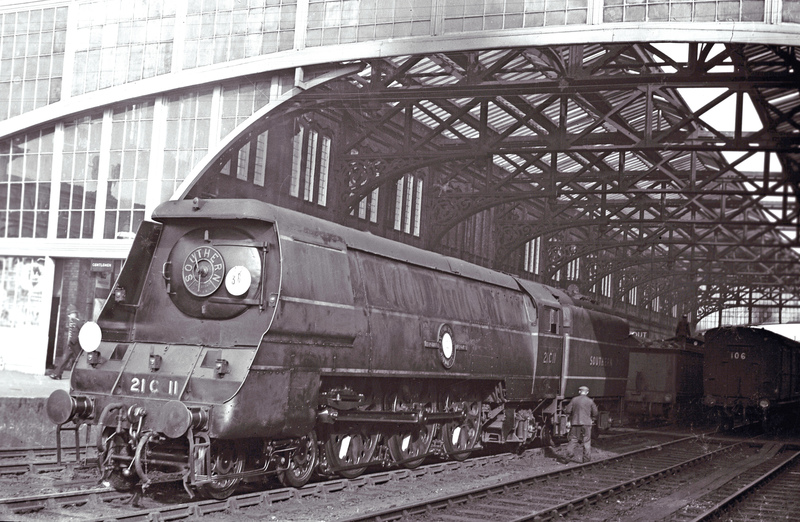 The other visible external changes prior to the rebuilding and subsequent return to service in July 1959, were that the front fairings between the cyclinfers and buffer beam were removed in may 1951 and the tender raves were cut down in August 1957. Membership of the Society costs only £10 per year and full details on how to become a member can be found here. Following on the success of returning 35006 Peninsular & Oriental S. N. Co. back to steam during 2016 it will be great to see 35011 also return in the future and excitingly back in her original ‘Air Smoothed’ condition. Like my page on 35006 Peninsular & Oriental S. N. Co. I will try and keep this page updated with future developments.